Specially formulated and packaged in an 8oz. pump to top bottle. Keep right on the counter or in the toolbox for a quick and easy hand cleaning. Apply The ULTIMATE Eaters® HAND CLEANER to soiled hands and wipe dirt and grease right off on to a clean towel, then rinse hands with water. The towel can be left for the next wash load and will clean free of all dirt and oil! 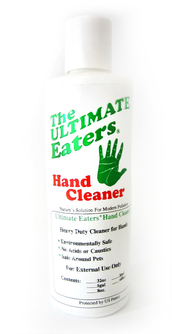 Keep The ULTIMATE Eaters® HAND CLEANER available for a fast oil free clean up.